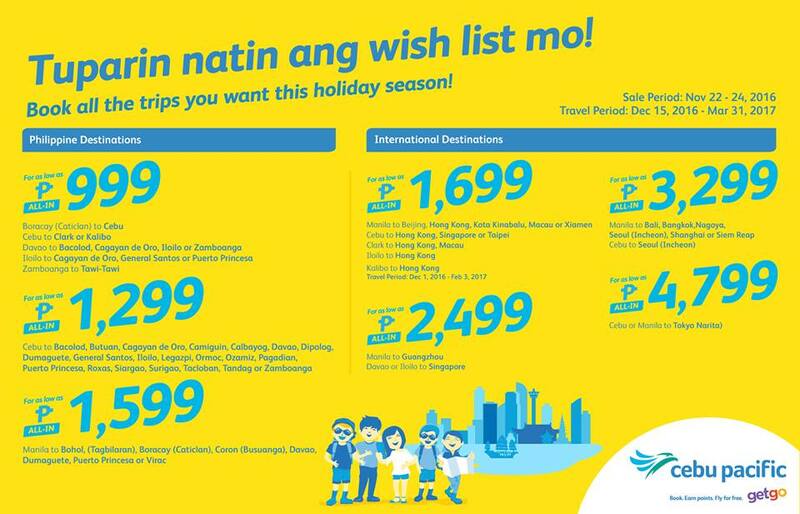 Piso Fare Promo 2017: The Philippines' leading carrier, Cebu Pacific (PSE: CEB), promotes travel to popular Philippine destinations, through additional frequencies starting fourth quarter of 2016. Domestic traffic is expected to increase for this year's semester and holiday break, with forward bookings reflecting growing demand for air travel to and from key destinations across the country. From October 30, 2016 onwards, CEB aims to meet this demand by adding frequencies to and from 18 domestic destinations. Piso Fare Promo 2017: Around 100 cabin crew positions available. 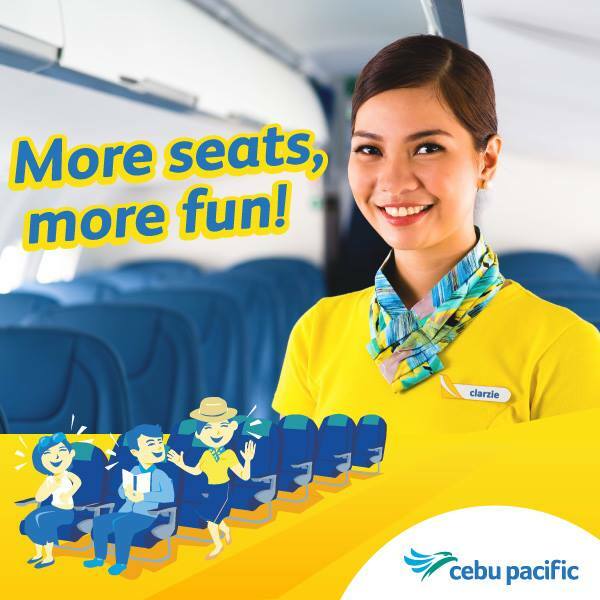 The Philippines' leading airline, Cebu Pacific (PSE: CEB) calls for aspiring cabin crew to join its recruitment fair in Manila, Cagayan de Oro, Davao and Iloilo between September and October 2016. 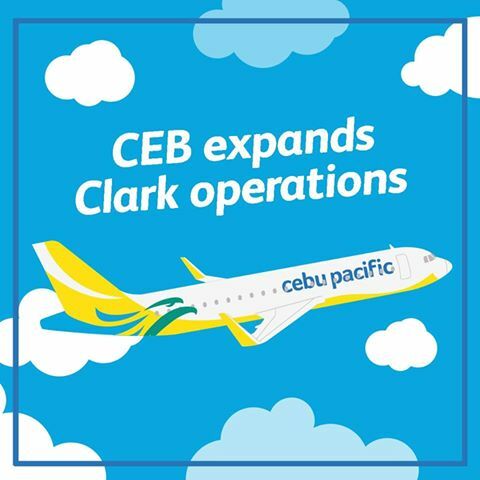 CEB is set to recruit around 100 cabin crew to increase its flying crew to more than 1800. ​The recruitment fairs for cabin crew will be held in the following cities: Manila (Cebu Pacific Building, Pasay City) on September 3; Iloilo City (Corazon Room, Iloilo Business Hotel, Glicerio Pison cor. Benigno Aquino Ave., Smallville Complex, Mandurriao) on September 9; Davao City (Mangosteen and Durian Function Rooms, Park Inn by Radisson Davao) on September 24; and Cagayan de Oro City (Eaton Room, Mallberry Suites Business Hotel, Florentino Drive, Limketkai Centre) on September 30. 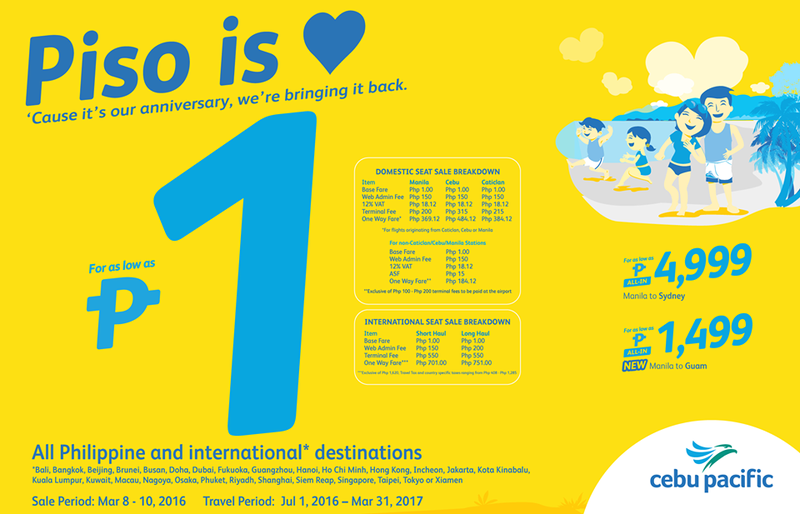 Piso Fare Promo 2016: Cebu Pacific mounted an additional frequency between Manila and Virac, Catanduanes, bringing its total number of flights to five times per week. 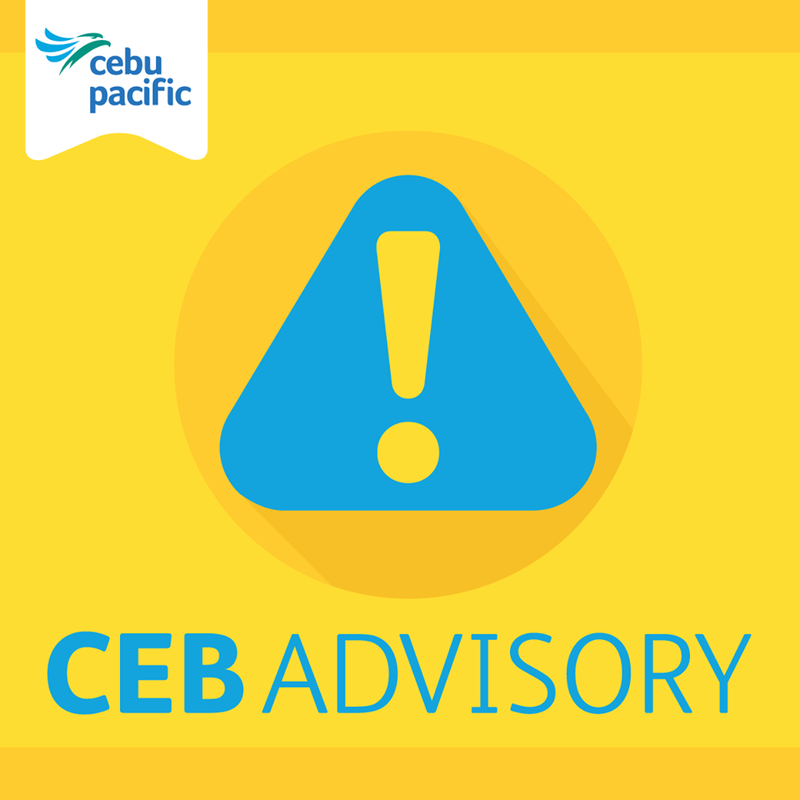 Utilizing a 156-seater Airbus A319 aircraft, CEB operates the new Virac service every Thursday, beginning June 23, 2016. Piso Fare 2016: Here's an almost Piso Fare 2016. 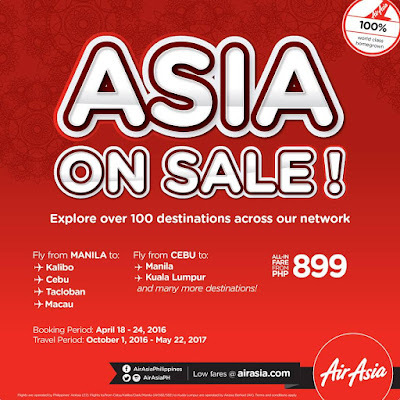 With a base fare of Php 16 in some selected domestic destinations in the country, you can now travel on a budget. 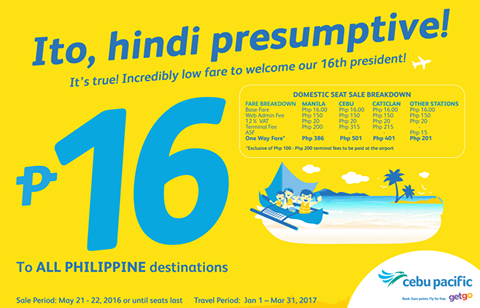 To welcome our 16th president in the Philippines, Cebu Pacific is glad to share this very affordable fare of Php 16 for everyone to avail. This is just the base fare and standard fees still apply. So what are you waiting for? Take advantage of it. Mind the travel dates and booking period! Quoted Fare is valid for one way travel only, inclusive of 7kg hand carry baggage allowance, base fare, web admin fee and taxes collected at point-of-sale. Domestic terminal fees for non-Manila/Caticlan/Cebu stations must be paid at the airport. Promo fares have limited availability and are non-refundable but rebookable subject to a rebooking fee of Php 1,500 for domestic destinations plus fare difference. For your convenience, flight changes, availing of prepaid baggage allowance for check-in baggage and web check in service can be done up to 4 hours before scheduled flight. 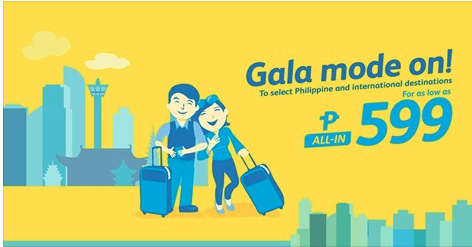 Piso Fare Promo 2016: There's always a chance for everyone to travel on a budget. 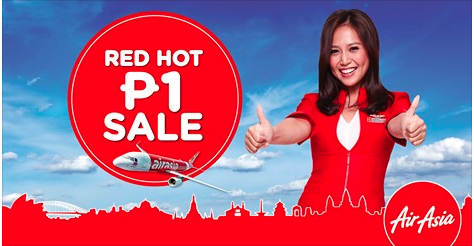 You just need to really find the best low fares you can avail at the moment. 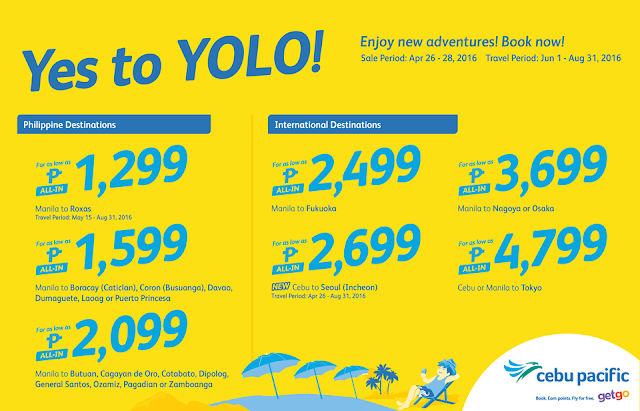 This time, Cebu Pacific has released their YOLO promo that you can actually enjoy. Check your travel calendar and see if there's still a slot you fill for your special trips! Once in a while, it is nice if you could visit new cities and countries. It pays to really check those new places and experience them first hand. So what are you waiting for? If you're still waiting for a Piso Fare promo, no, that's not happening yet! 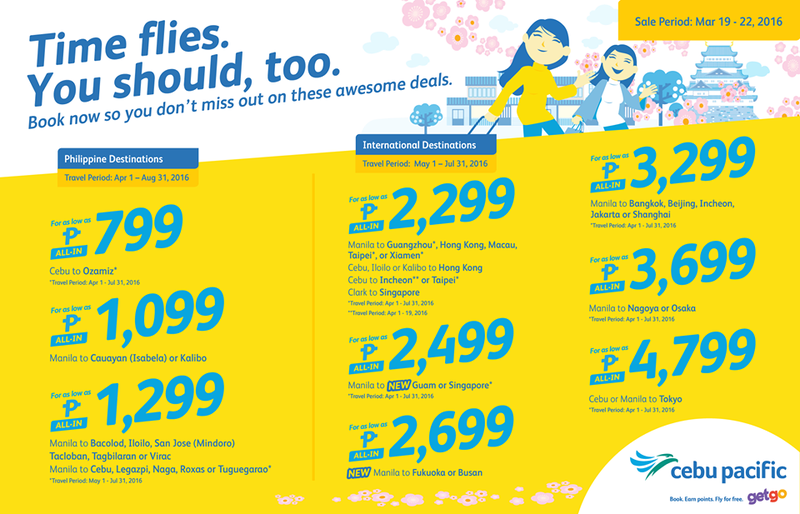 Just grab these cheapest offerings from Cebu Pacific! 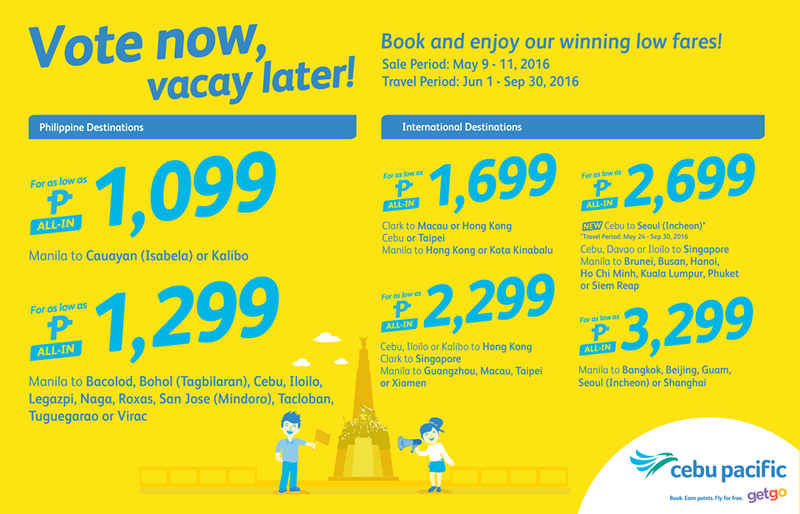 Piso Fare 2016 Promo: This is still a continuation to the recent promo that Cebu Pacific has released the previous week. 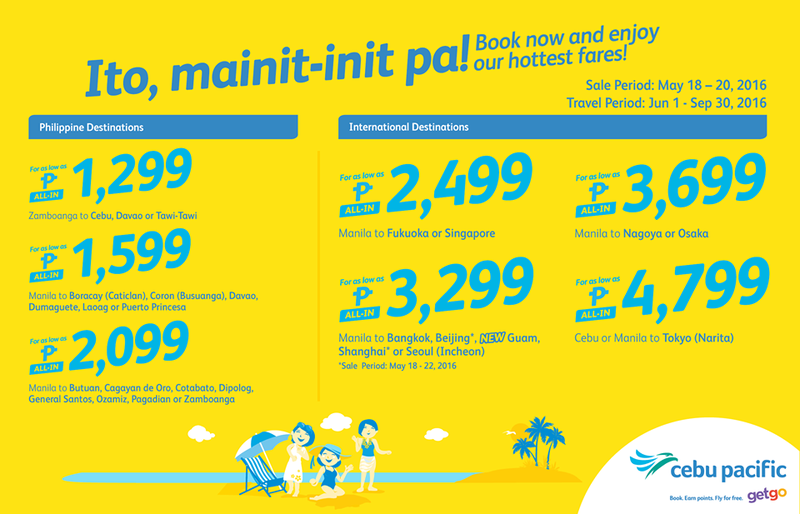 So you can still enjoy to book an all-in fare of Php 599 but on some select Philippine destinations only. So pls. double check the information below. There are set travel dates for the said promo so please make sure you take note of that before booking your flights. 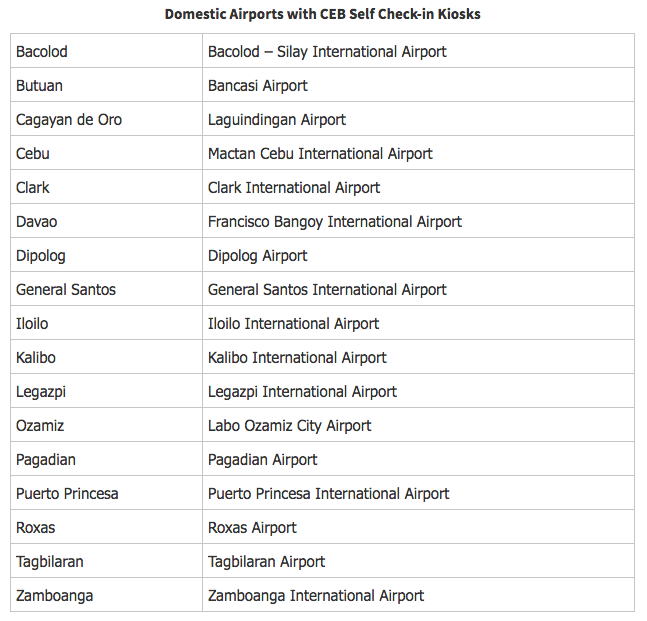 There are cheaper flights coming from Davao, Iloilo and Zamboanga. 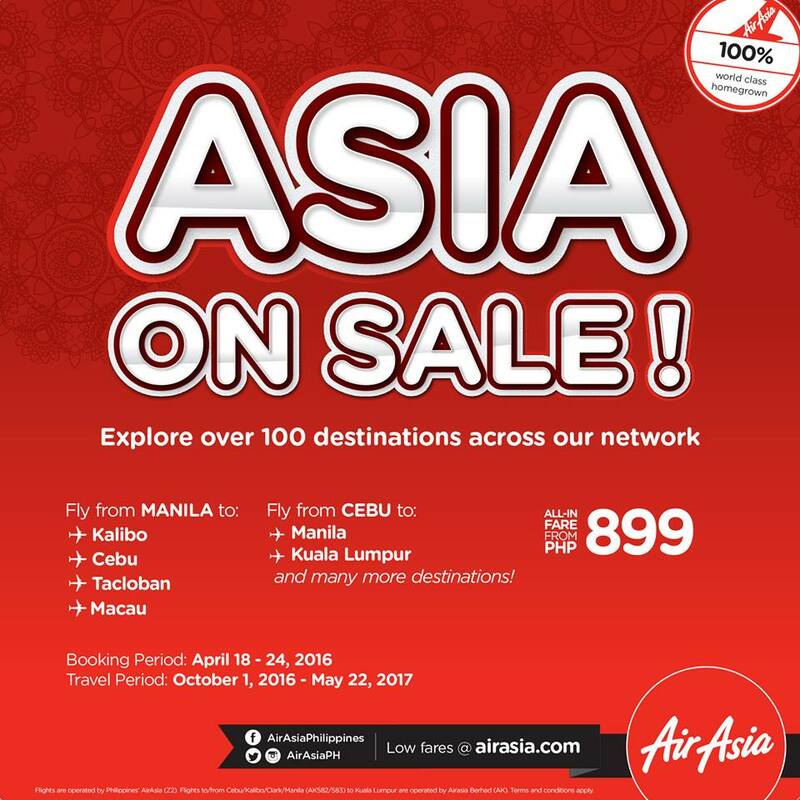 If you are from Cebu, you'll get a good affordable fare too! Piso Fare Promo 2016: Get the advantage of booking this cheapest flight you can have to visit your favorite destinations once again! 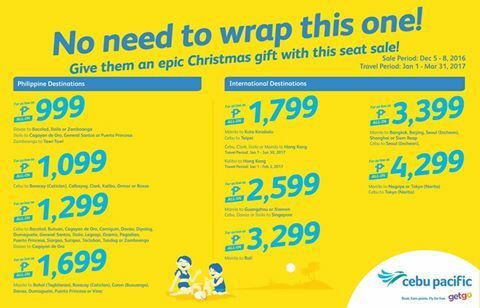 Cebu Pacific has been offering this very affordable promotion in some select destinations in the country. 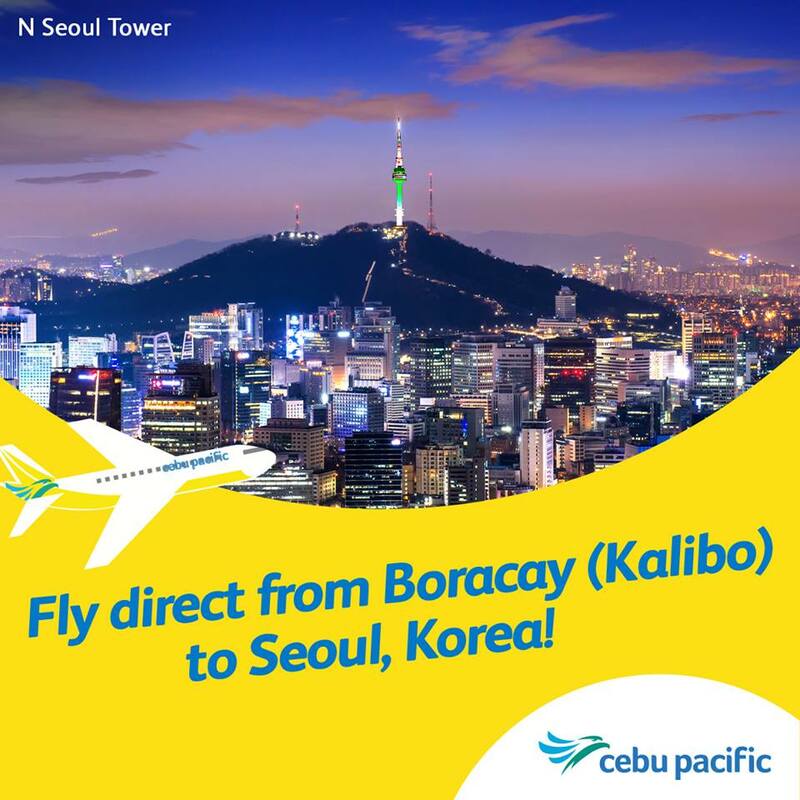 If you are from Boracay or Cebu, you can visit the capital city! For some international flights, there are a lot of cheaper fares you can avail. 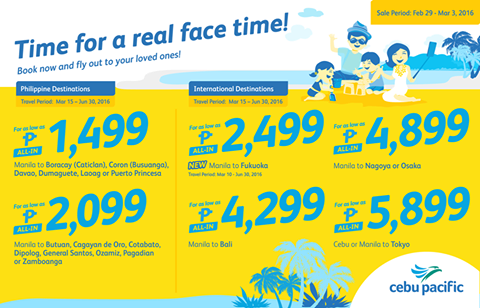 So call your friends now and start making your travel itinerary. Piso Fare Promo 2016: Hong Kong is one of the tourists' fave destination when it comes to vacation and travel with family. 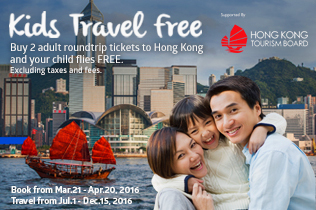 You can get to enjoy a free flight with your kid when you book 2 adult round trip to Hong Kong which is until April 20, 2016. So do better grab this Philippine Airlines promo. Your kid will get a free flight! Isn't that amazing? Piso Fare 2016: Time flies. You should too! Book now so you don't miss out on these awesome deals. Piso fare promo is already over so don't cry over that. Move on as there are cheaper fares that you can still avail. Pls. be mindful of the the location and destination where promo is set. Not all dates are on promo so pls. 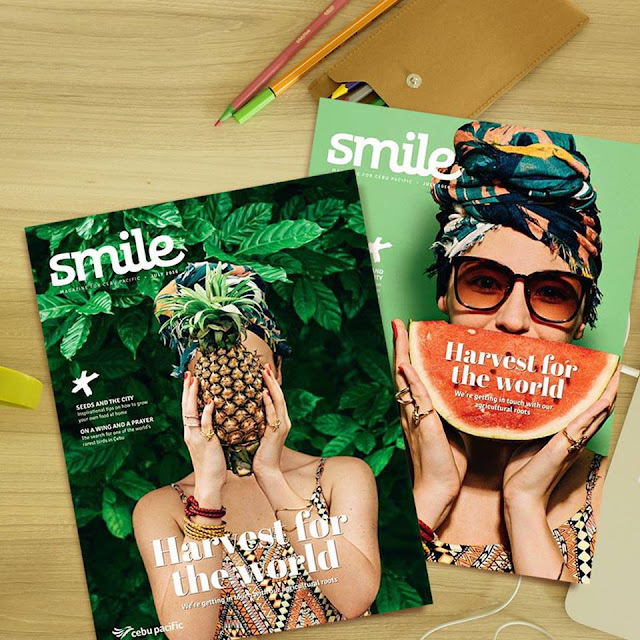 be patient in finding that promo fare! 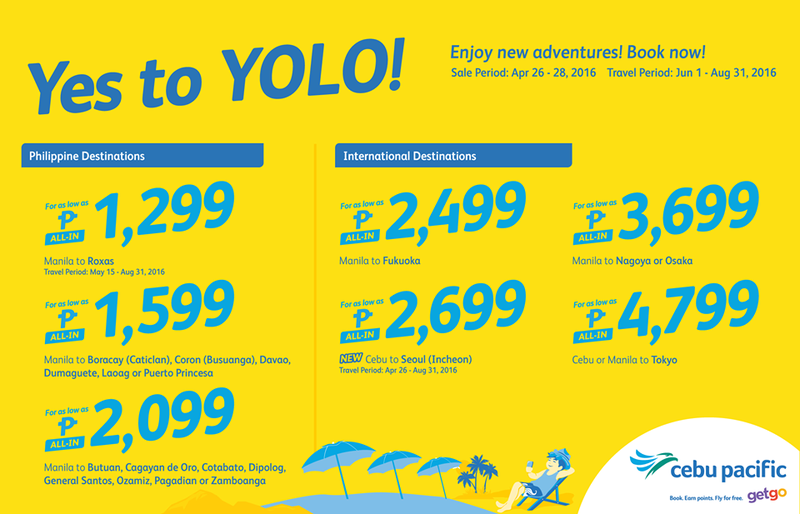 Book now until Mar 22, 2016! Advertised Guam fare is inclusive of base fare, applicable fees & taxes, Web Admin Fee and 7 kg hand-carry baggage allowance. Bookings made seven (7) days or more prior to departure may be presented for refund without charges within 24 hours of purchase. 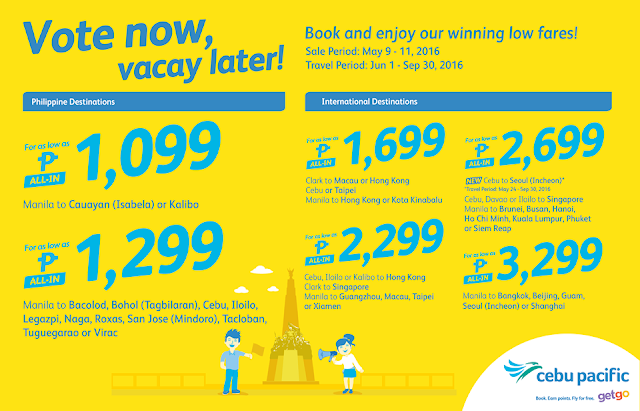 Piso Fare 2016: Cebu Pacific has just launched their PISO FARE promo for this year 2016! This is to commemorate their 20th Anniversary! So enjoy this PISO SALE when you can. Book as many flights as you can! It's just a peso anyway! Be mindful of the travel dates too! 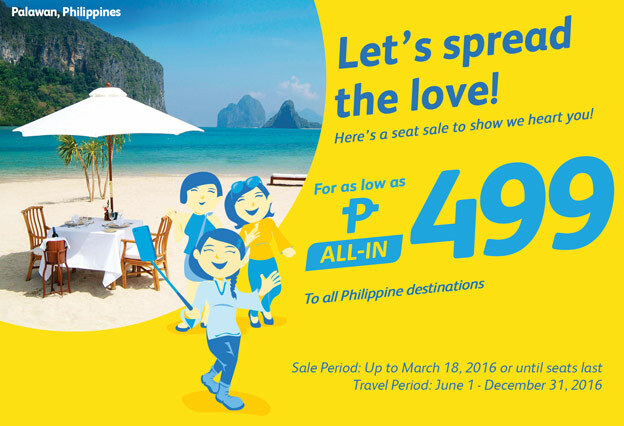 Piso Fare Promo 2016: From as low as P1 BASE FARE ONE-WAY! Hurry, offer ends this Sunday! 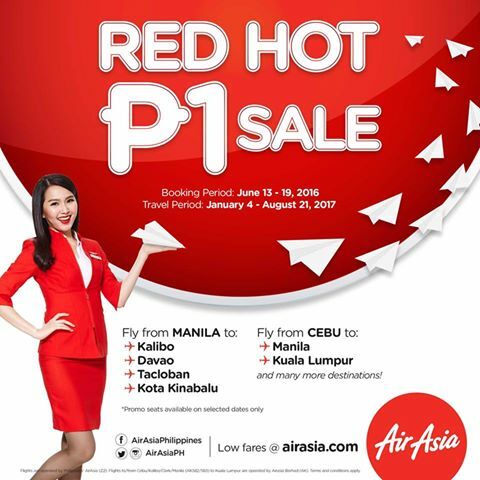 Fly from Cebu w/ our RED HOT PISO SALE! Book NOW! You asked for it, we're bringing it back! Our ‪#‎REDHotPiso‬ SALE is now available at http://bit.ly/REDHotPiso_aaph! 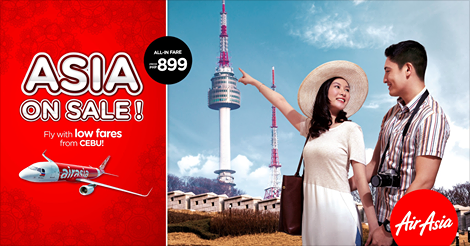 Fly to/from Manila, Cebu, Kalibo, Macau, Incheon and many more from as low as P202 ALL-IN, one-way fare ONLY! With fares this low, you just have to book now and go! Share this with your family and friends NOW! 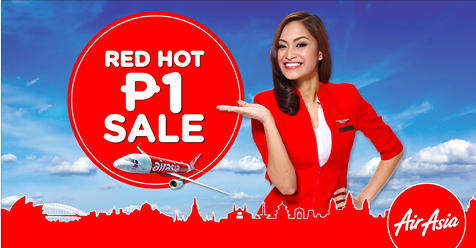 - RED HOT SALE booking period: 7 March 2016 - 13 March 2016.